One in a million. A term that is more than appropriate for Argyle Pink Diamonds. For every million carats of rough diamonds mined each year, only one carat makes it to the gem quality to be offered for sale at the annual, world-renowned Argyle Pink Diamond Tender. From all the stones that are produced annually, the pink diamonds over 0.5 carat would easily fit in the palm of your hand. Before the discovery of the first diamond glinting from an anthill in the East Kimberley region of Western Australia, pink diamonds were a scarce resource, emerging only sporadically from a few mines in the world. The subsequent exploration of the volcanic pipe under that first find has since changed the world of coloured diamonds. Today, this mine in Australia’s northwest is the birthplace for about 90% of the pink diamonds sold world-wide. However, the rarest of all diamonds is set to become even rarer still as this treasured source is limited! It is estimated that by the year 2020 the mine will yield no more. Given the location of the Argyle mine, so close to Lake Argyle and our founding store in Kununurra, Nina’s has had a special relationship with it since the very beginning. In fact, Nina’s holds invoice #001 for the first diamond ever sold by Argyle! 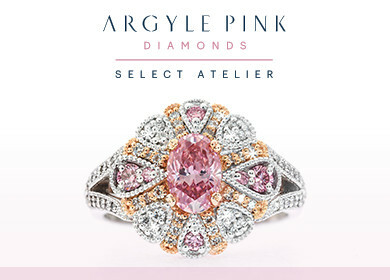 Nina’s is proud to be an Argyle Pink Diamond Select Atelier. One of less than 30 companies in the world to hold the esteemed title. Partners in passion and counted by Argyle as one of “the most trusted jewellers in the industry, relied on for unerring quality, integrity and spectacular creativity”. We hold an enviable range of pink diamond jewellery, including a magnificent piece designed around an oval-shaped 0.6 carat diamond named ‘The Peony’, purchased through the annual tender. This one-of-a-kind ring was worn by Jules Sebastian on the red carpet when her husband, Guy Sebastian, won an ARIA at the 2013 awards ceremony. The pleasure of owning a pink diamond is almost impossible to put into words. Their increasing rarity and uniqueness make them an investment in all senses of the word. To find your own pink diamond dream, browse the collection online or in store.